The term ‘Synthetic Phonics’ began to be widely used after the publication of a study carried out in Clackmannanshire, in Scotland. Researchers from St Andrew’s University found that one method of learning to read produced much better results than the other methods they looked at. This method was called Synthetic Phonics. This success has since been replicated in numerous studies world-wide. Why is it important to focus on the sounds? It is important to know both the sounds and the letter names when learning to read. Those children who know most of the letter names and their corresponding sounds by the end of pre-primary are far more likely to do well in literacy-based tasks (reading, spelling, written expression) throughout their schooling than those students who know very few. When we say the alphabet we tend to use letter names – Ay, Bee, Cee etc. When we read or spell a word (decode or encode) it is important to know the speech sound that the letters are representing, for example the speech sounds /k/, /a/, /t/ blend together to make the word “cat” – not /Cee/, /Ay/, /Tee/. Which sounds should children learn? It is generally agreed that there are about 44 sounds that make up words in the English language. Given that there are only 26 letters in the alphabet we need to combine some letters to represent the remaining speech sounds. In a number of cases, two letters (or sometimes three) are put together to represent a specific sound, such as ‘s’ and a ‘h’ representing the /sh/ sound (as in ship) or ‘t’, ‘c’ and ‘h’ representing the /ch/ sound (as in match). When two letters are used to represent a specific sound it is called a ‘digraph’. Vowel sounds are particularly important as there is a vowel sound in every syllable of spoken English. Of the 44 speech sounds in English, 19 are vowel sounds. What does Synthetic Phonics actually mean? In a program using a synthetic phonics approach, children start by learning about the sounds within spoken words. They need to be able to: hear that sentences are made up of words; that some words rhyme; that some words start (or finish) with the same sound; and, that words are made of speech sounds that are blended (synthesised) together. As part of learning about the different sounds we use to make words, children should be taught about the letter (or letters) we use to write the sound down. For example, if children are learning about the /s/ sound through matching games, rhyming, alliteration (the slimy, slithery snake slid slowly somewhere special) and other oral language activities, it is important to explicitly link the sound with the letter we use to write the sound down. When introducing the letter we use to write the /s/ sound down a teacher might write or display the letter ‘s’ and say “we use this letter to write down the /s/ sound. The name of this letter is “ess”. 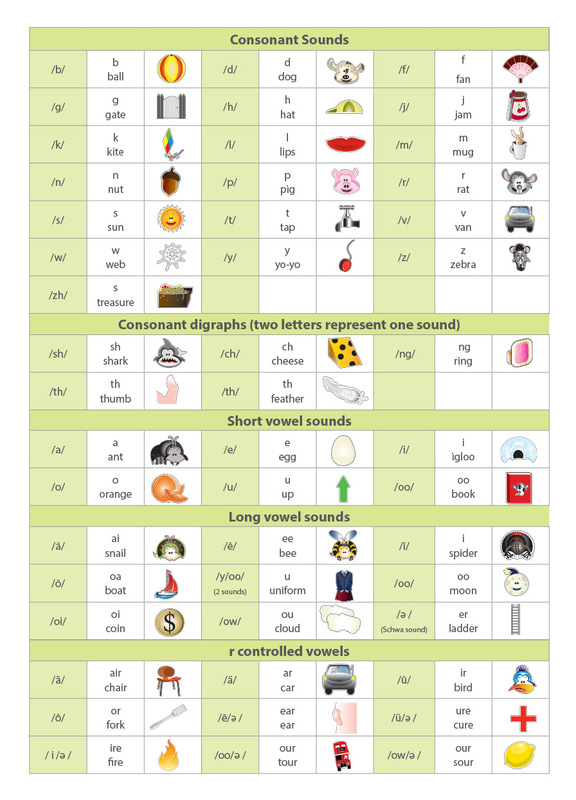 Children learn letter representations for each of the 44 sounds of English. When they see a letter or digraph they should be able to say its sound. They then learn to blend (put together) these sounds to make words. Once they can do this they are reading words. There are numerous ‘Synthetic Phonic’ programs available and they all have more or less the same set of sounds. There are a few small differences. Each program has its own order for introducing the sounds, but evidence suggests that as long as all the sounds are covered, the order doesn’t seem to matter. Generally programs introduce commonly used consonants and short vowel sounds first, followed by long vowels, digraphs, adjacent consonants and r-controlled vowel sounds (such as /er/ and /or/). Children learn one way of writing down each of the sounds and are then gradually introduced to spelling alternatives for each of the sounds. Sometimes they are still learning about the more complex spelling alternatives in upper primary or even secondary school. For example, we first learn that the /s/ sound is written down using the letter ‘s’ (as in sun). Later we learn that we can write the /s/ sound using the letter ‘c’ (as in city) or ‘sc’ (as in science), and later still we learn that we can write down the /s/ sound using the letters ‘ps’ (as in psychic) or ‘st’ (as in listen). What material should children learning to read be given? One of the most important principles of Synthetic Phonics is that a child should never be asked to read something that is too difficult for them, or that they do not have the skills to read. Within the first few sessions of synthetic phonics children should be able to read words made up of the sound / letter relationships they have learnt. For example, if the first six letters of a structured synthetic program are ‘s’, ‘i’, ‘t’, ‘m’, ‘a’ and ‘p’, children can read it, at, mat, sat, sit, pit, tip, tap, pat etc. Start with small regular words. Regular words are words where the sound / letter relationships are the ones the child has been taught. These small regular words are often referred to as ‘cvc’ words. The term ‘cvc’ means consonant, vowel, consonant – words like cat, dog, leg, pin, bus. Once children can read these they then move on to reading longer words, like cobweb, and words with digraphs, like ship. Why is there a problem with more advanced reading material? If a child is asked to read something containing words that are too difficult for them they start to simply guess the words. They use the pictures on the page or the first one or two letters and this becomes their reading strategy. It might work for the first year or two but it is not an effective reading strategy in the long term. It can become very frustrating, and the child begins to believe that reading is too difficult for them. Strong fluent readers become very proficient at decoding words very quickly. They do not rely on pictures, context or guessing as their primary strategy. It is important to read books based on Synthetic Phonics. That is, the books should be linked to the same sequence of sound / letter relationships that the teacher is using in the classroom. Initially the books may only include 6 letters (for example ‘s’, ‘i’, ‘t’, ‘m’, ‘a’ and ‘p’) plus one or two high frequency words (for example, ‘I’, ‘was’). As the child develops a greater knowledge of the sound / letter relationships the books he or she reads will include these new letters and digraphs. Once they know their sounds, your child can have a go at reading any small regular words in books when they are practising their reading. There are many synthetic phonics reading series. Two of the series recommended by DSF include: the Dandelion Readers series and the Read Write Inc Phonics series. Both of these series follow a very structured, systematic introduction of new sounds and letters, in reading books that are both appealing and entertaining. How quickly should children progress through a synthetic phonics program? Children should be introduced to new concepts gradually and their knowledge built up a step at a time. However the whole point of learning the sounds is to use them to read and write, so they need to be covered quite quickly. Most children are able to learn the sounds at the rate of three or even four a week. It is anticipated that students will be introduced to a structured synthetic phonics program in pre-primary and be able to read and write simple sentences by the end of the year. What should I do if a child cannot learn the sounds that quickly? Some children do take longer than others. It is no use trying to teach new sounds if they are unable to master the ones they have already been introduced to. Revisit the sound / letter (phoneme / grapheme) relationships the child does know and then add new sounds gradually, at a pace that he or she can cope with. It is important to remember that English is not a completely regular language. There are well over 600,000 words in the Oxford English Dictionary and the majority of these have been taken directly from other languages: Latin, French, Greek, to name a few. Although they have been absorbed into English, the words have retained much of their original spelling. This is why English takes so much longer to learn than many other alphabetic languages and explains why there are so many spelling alternatives for some of the speech sounds. It is important to remember that it is not, however, a completely irregular language, and it is far easier to learn and recognise the patterns that are there, than it is to try and remember every word individually. Is it just for reading? A Synthetic Phonics approach should also benefit spelling and writing. As well as putting together the sounds to read words, the children should be taught to listen for the sounds in words so that they can spell them. If they can hear the sounds in a word and know the letter/s that we use to write down the sounds, then they can have a go at writing the word. Does this mean children taught using a synthetic phonics approach will spell phonetically? As with reading, children need to build up their knowledge of spelling gradually. To begin with, they will have learnt one way of writing a sound, so for example the sound /ee/ is learnt as two ‘e’ letters. Children just starting out will write the ‘ee’ spelling whenever they hear the /ee/ sound, for example they might write ‘eet’ instead of ‘eat’. As the other alternatives are introduced to the children, and they develop a knowledge of word families, their spelling will improve. Also as children read more, and see the words in their reading, they begin to learn and recognise which way words are spelt. Why is this approach more successful? Children taught by Synthetic Phonics are being taught the code by which reading and writing work. This means they are being given the tools they will need to become independent readers and writers. If they do not understand how words are put together, and how to go about breaking the code so they can read a word, any unknown word is a mystery. They might be able to think it looks like another word they know (although this is quite a complicated thought process that small children find very difficult, and of course they might be totally wrong). They might be able to guess the meaning of the word from the context of the other words about it, but they have no way of decoding the word if they do not have this phonic knowledge. Good readers rarely guess using context clues, poor readers try to guess from the context (or pictures) frequently. Good readers don’t need to rely as much on context clues because their decoding skills are so strong. Guessing from context is frequently unsuccessful, time consuming and reduces fluency. It has been estimated that only one out of every four words within a passage can be predicted using context cues and that only about 10% of content words can be predicted using this strategy – generally students need to be able to decode these words in order to make sense of what they are reading. Poor readers also tend to rely on initial consonant cues, guessing the word on the basis of the first one or two letters. 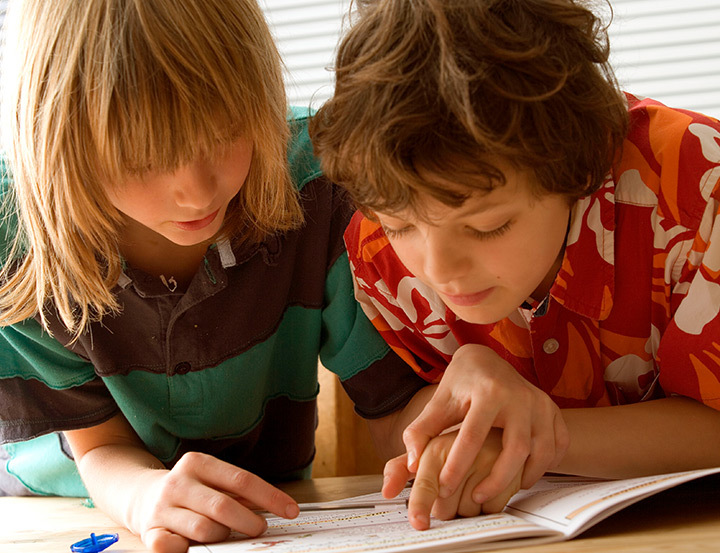 Will synthetic phonics help children who are dyslexic or having trouble learning to read? Children find it difficult to learn to read for a number of reasons. For the majority of children a structured multi-sensory program that includes systematic synthetic phonics will prove successful. Some children do, however, have an inherent processing difficulty (often phonological in nature) that results in them finding learning to read and spell extremely difficult. They may have poor memory skills, making it difficult for them to remember what they are taught. They may have great difficulty segmenting words into individual speech sounds, making it difficult to link phonemes (speech sounds) to graphemes (letters). These children will find it difficult whatever method is used. Synthetic Phonics, taught in a systematic and multi-sensory way, is the approach most likely to result in successful outcomes. Children who are dyslexic usually stand out as their reading ability does not match with their abilities in other ways. Reading can be a slow and frustrating journey but because the system is logical and goes forward step by step they are usually successful using a Synthetic Phonics approach. Good Readers and Synthetic Phonics. Synthetic phonics instruction is particularly beneficial for children at risk of learning difficulties or who are suspected of having a learning disability. However, research also demonstrates that all children benefit from phonics instruction, learning to read and write at a faster rate than they would without phonics. It is also the case that some children, who have been taught to read using other methods, seem at first to be making good progress but then seem to stumble. Frequently, these children have relied on visual-memory strategies and to begin with they learn the words quickly by memorising them as whole words. As they progress though, the number of words they need to know increases, and eventually they slow down (usually around Year 2 or 3). They then find it difficult to move forward. These children have to be taught the code if they are to continue to make good progress with their reading, and cope with more difficult words. Those children relying on visual memory strategies to read can be identified using a nonsense word test. Nonsense words are “made up” words, for example ‘zam’. Because these words are invented, the child will not have seen them before and in order to read them he/she will have to decode them. There are two nonsense word tests available to download from The Reading Reform Website (www.rrf.org.uk). If children struggle to complete a nonsense word test, then teaching them the principles of Synthetic Phonics will assist them to continue to be good readers and make good progress. Using nonsense words is a good way to help these children break the visual memorising strategy. Is it ever too late to teach Synthetic Phonics? Whether it is a child or adult who wants to learn to read the information they need to know and the process they need to go through is exactly the same. Obviously, the approach taken with younger and older learners is different. Many children make dramatic gains in reading ability and confidence when taught by Synthetic Phonics having struggled for years with other methods. There are some letters that are used to write down sounds already represented by other graphemes. For example we use the letter c to represent the /k/ sound (already represented by the grapheme ‘k’) and the /s/ sound (already represented by the grapheme ‘s’). * the q is almost always paired with the letter u.